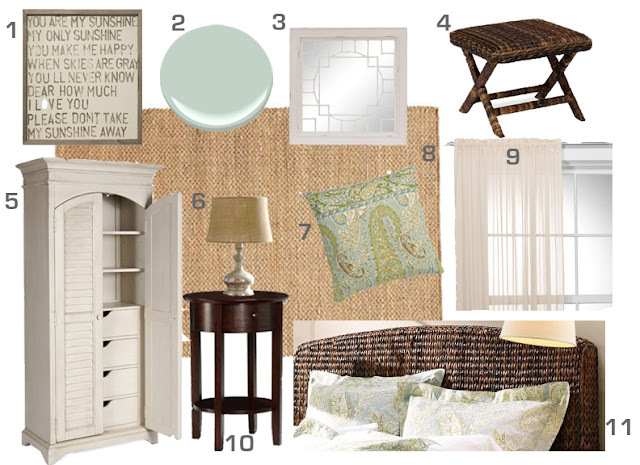 I've been working on our master bedroom for a couple of months now and back in February, I shared with you this mood board that I created. and picked up some fun hemp and coral paisley throw pillows from Marshalls and HomeGoods. I've been having a hard time completing the room because I can't decide on dressers for me and Jake. 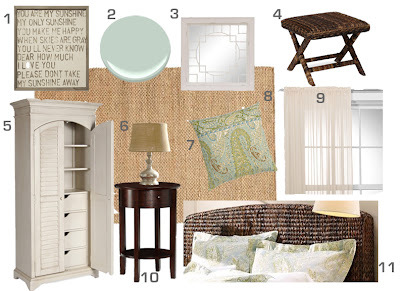 We already own the Pottery Barn Seagrass headboard, Seagrass stools, Julia Bedside Tables, and jute/wool blend rug. Originally, I was going to go with a white armoire, but now I'm changing my mind. Jake and I really need our own dressers, and I think the room might be a little more cohesive if we stick with a mahogany stain. I've had the hardest time trying to match a wood stain to our Seagrass headboard, but I think I've finally decided on the Pottery Barn Farmhouse Tallboy and Extra-Wide dressers. They are a big splurge, so I'm a little reluctant. I've been holding onto a couple of PB gift cards and PB design services offered me 10% off to order through them, so I'm thinking I might bite the bullet and order them. I also picked out some Ikat curtains from Ballard Designs. which I love, but they won't ship until May 25th. I'll be waiting patiently. With all of those updates, this will give you an idea of where we're at with the room. (The paint color is not quite this bright). I still need to buy a full-length mirror, some art for over the bed, bedside table lamps, a small chair, and accessories. At this pace, maybe I'll be done by July! So excited! I love the (toned down) wall color with the rug and bedding. Can't wait to see it all finished.